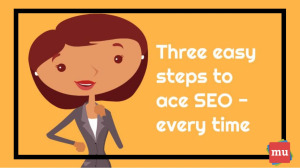 media update offers a simple three-step strategy to buff up your SEO skills. In today’s world, SEO is so important because consumers are constantly searching for brands, products and information online. And for those consumers who don’t already know about your brand, searching the Internet is likely how they’ll find you. It is imperative for you to ensure you’re putting out SEO-friendly content if you want to grow your consumer base. Changing your brand perception on social media can be instrumental to your success. Read our article to find out how to do just that: Five ways to change your brand perception for the better.